Up to 16m, with females being larger than males. New born calves are about 4.5m. For many whale watchers throughout the world, humpbacks are the most endearing, as they are the most social and frequently perform aerial displays, such as breaching (jumping out of the water), or slapping the surface with their pectoral fins, tails, or heads and thus one of the most enjoyable whales to observe in the wild. Another reason we are so drawn to them is that the males love to sing. The humpback whale song is thought to be the most complex in the entire animal kingdom. After years of research however, we are yet to grasp the complexities behind their underwater vocal repertoire. The humpback whale is a species of baleen whale, characterised by having baleen plates for filtering food from the water rather than eating with teeth. Humpback whales are well known for their long “pectoral” fins, which can be up to 4.6 m in length. These long fins give them increased manoeuvrability; they can be used to slow down or even go backwards. Humpback whales travel great distances during their seasonal migration, the farthest migration of any mammal. Their fluked tail has a wavy trailing edge and is unique on each individual, much like a fingerprint. During winter and through spring we see hundreds of humpback whales travelling along our coastline, often in large mating groups. The humpback whale is considered to be a vulnerable species. Up to 18m, with females being larger than males. They find many of our Southern African bays favourable for giving birth and they love the protected area between Buffalo Bay and Brenton on Sea, and very often during winter, mothers are seen spending several weeks nursing close to shore with new-born calves. We also often see large mating groups, where the occasional breach and other exciting whale behaviours are seen. The Southern Right whale is readily distinguished from others by the callosities on its head, a broad back without a dorsal fin, and a long arching mouth that begins above the eye. Its skin is very dark grey or black, occasionally with some white patches on the belly. The right whale’s callosities appear white due to large colonies of cyamids (whale lice). The Bryde’s whale is a moderately-sized baleen whale and a year round resident of our Southern African waters, continually moving up and down our coastline in search of food. Research has shown that the area between Mossel Bay and Jeffrey’s Bay has the highest number of the inshore Bryde’s whale species. Compared to their relatives the right whales, they are more slender and streamlined in shape, and most have narrow, elongated flippers. They have a dorsal fin, situated about two-thirds of the way back. They feed mostly on small crustaceans, but also on various fish species. Bryde’s whales tend to be more shy and elusive than our migrating visitors and often take deep dives, staying down for fairly long periods of time while feeding. Killer whales are in fact not a whale but the largest species of dolphin. The whalers named them killer whales, because they saw them killing other species of whale and dolphin. Killer whales live in the deep water and are sighted intermittently throughout the year when they come inshore. They have a very robust body, large rounded flippers, and a small beak. A male’s dorsal fin is tall and triangular, and can reach up to 6 feet tall. A female’s dorsal fin is much shorter and curved. Killer whales have 10-14 pairs of large teeth, which they use to eat a wide variety of prey. These whales have been known to feed on small schooling fish, squid, seals, and even large baleen whales and sperm whales. 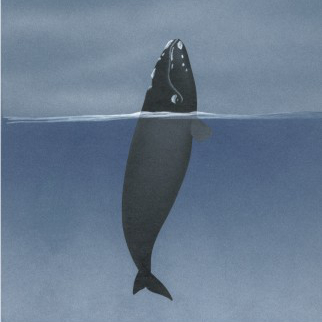 The shape and size of the blow is distinctive to each species, based on the size and shape of their blowhole. 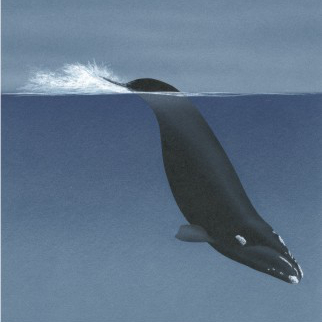 Southern Right whales have a very distinctive V-shaped blow which can measure up to 4 metres high. Humpback whales have a tall, column-shaped blow. And orcas typically have a bushy-shaped blow. If you see something that looks like a blow, keep watching! Some whales can dive for 10 minutes or longer, so keep looking in the general area where you first saw the blow. The Humpback whale gets its name from its distinctive bump in front of its dorsal fin. You will see the similarities with the Humpback dolphin. 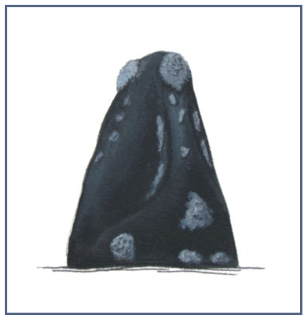 Notably the Southern Right whale does not have a dorsal fin. The dorsal fin on both the Bryde’s and Minke whale are very similar and situated 2/3 down the back. Orcas have pronounced triangular fins that can grow to over 6 feet high on males. Cetaceans have powerful tail flukes that propel them through the water. The shape and size of the tail flukes is different for every species. In some species, like Humpbacks, the markings on the tail flukes are unique like a fingerprint and can help identify individual whales. 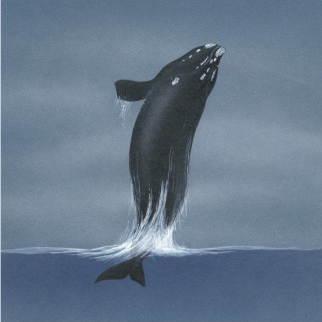 The whale is jumping out of the water, sometimes clearing it completely. Similar to a breach, but without the rotation slamming their heads down, landing chin first. An inquisitive move, slowly lifting its head out of the water to have a look around. Usually happens during a mugging. Quite an explosive move throwing its tail stock around or slapping its tail on the surface.